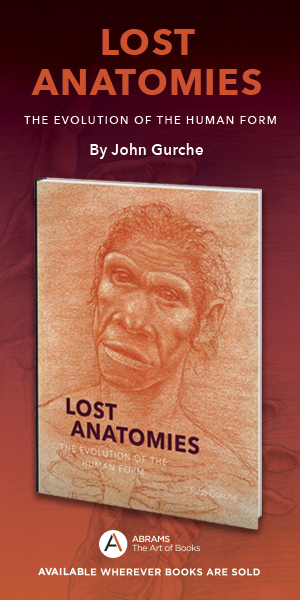 The following story is contributed by The Academy of Natural Sciences, one of Natural History magazine’ s Museum Partners. Members of any of our partner organizations receive Natural History as a benefit of their museum membership. The Academy of Natural Sciences, Philadelphia’s Natural History Museum, is the oldest continuously operating natural science research institution and museum in the Americas. It was founded in 1812 “for the encouragement and cultivation of the sciences, and the advancement of useful learning.” The Academy has continuously redefined its mandate to be “useful” through research and education that reflects the societal needs of the times. In 1948, for example, long before water pollution and environmental degradation became topics of public concern, the Academy established the Environmental Research Division. This marked the beginning of a broadened research orientation for the Academy, which included applied research in aquatic ecosystems as well as the traditional systematics research—discovering and cataloguing organisms. The museum’ s halls showcase not only dinosaurs, dioramas of mammals, two ancient Egyptian mummies, and other permanent or special exhibitions but also live animals, including birds, mammals, reptiles, and invertebrates. Abbe conducts most of his measurements right on the boat. George Abbe's work is not at all glamorous. It’s tedious, repetitious, and conditions can sometimes be downright nasty. 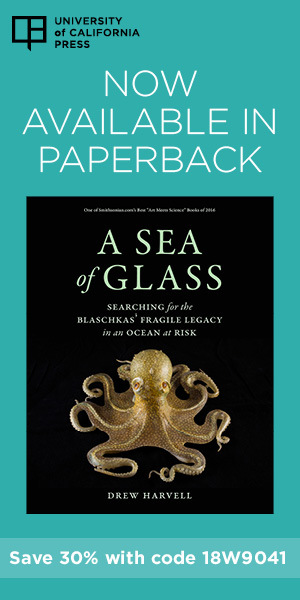 But it’s important work that helps scientists and environmentalists understand the nature of the Chesapeake Bay, an area of special interest for the Academy. And for Abbe, it’s just plain fun. Now, after 41 years of surveying the bay’s blue crab and oyster populations, Abbe is retiring. Most of this work was conducted as a research scientist at the Morgan State University Estuarine Research Center (ERC) on the Patuxent River in St. Leonard, Md. The ERC, formerly known as the Benedict Estuarine Laboratory, was founded by the Academy in 1967 in Benedict, Md. It moved downriver to St. Leonard in 1994. 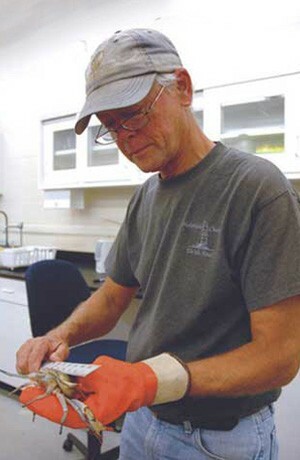 Abbe leaves behind quite a legacy, most notably his role as leader of the longest continuous survey of the blue crab (Callinectes sapidus) population in the Chesapeake Bay. Abbe began the survey in 1968, one year after he was hired by Dr. Ruth Patrick as the very first employee of the Academy’s estuarine laboratory. Research was conducted near Calvert Cliffs, Md., along the western shore of the Chesapeake to determine the effects of cooling-water discharges from power plants on populations of blue crabs and oysters (Crassostrea virginica). The work evolved into two areas of study for Abbe, including the blue crab survey, one of only four major fishery-independent surveys conducted in the Chesapeake for assessment of crab stocks. The second area includes oyster growth and mortality, accumulation of metals (copper, silver, and cadmium) by oysters and the effects of Dermo disease on oysters. Through these studies, Abbe has seen firsthand the effects of overharvesting and pollution on the populations of blue crabs and oysters. “We had 50 times as many oysters 100 years ago as we have now,” says Abbe. And, because of overharvesting, the blue crab population has been declining in both abundance and individual size. “Crabs can usually survive in nasty conditions. What they can’t live in is an area that is heavily fished. That’s what is driving populations down,” Abbe says. Abbe's data shows that the blue crab population has been decreasing in individual size. The upside of Abbe’s work is that his data sets have influenced the formation of states’ regulations protecting the commercial oyster and crab industries. So, not only has he recorded the struggling populations of blue crabs and oysters, he’s also researched and monitored the recovery of these organisms. Some recent restrictions instituted for crabbers include a decrease in fishing effort and limiting the harvest of females. 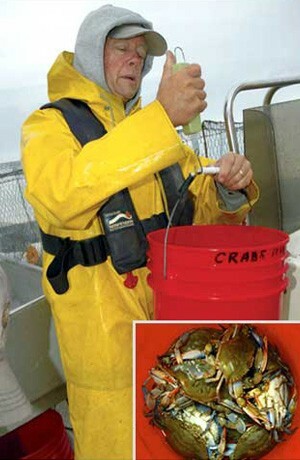 While these restrictions are meant to encourage a population increase of blue crabs, results are not yet known. “It’s a wait-and-see kind of thing,” says Abbe. In the last seven years, more than one billion oysters have been planted on oyster bars in the bay, and 100 million oysters planted in the Patuxent River, one of the bay’s tributaries, Abbe says. These efforts were led by the Oyster Recovery Partnership, a coalition of individuals, businesses, organizations, and institutions, including the Academy. Abbe’s dedication to his work earned him the prestigious title of Honored Life Member of the National Shellfisheries Association in 2003, one of his greatest professional accomplishments, he says. His lengthy career has also earned him the respect and admiration of his colleagues. 1967: The Academy of Natural Sciences establishes the Benedict Estuarine Research Laboratory in Benedict, Md. 1994: The research lab and its staff move to a new facility in St. Leonard, Md., renamed The Academy of Natural Sciences Estuarine Research Center (ERC). 2004: The ERC is deeded to Maryland’s Morgan State University. The Academy continues to have a presence at the center and collaborates with ERC scientists on various estuarine projects.